When a Pennsylvania Republican legislator responded to the invalidation by his state’s Supreme Court of the congressional map he and his colleagues had fashioned by introducing articles of impeachment of the five justices involved, nobody was terribly surprised, even though Cris Dush’s argument that the court was defying the sovereignty of God was a bit exotic. And when Republican U.S. representative Ryan Costello joined the impeachment parade, that, too was predictable: The new congressional map made his relatively safe district highly competitive. Of course he’d respond to this existential threat to his career with every weapon imaginable. Pennsylvania Sen. Pat Toomey (R) called for a “conversation” about impeaching state Supreme Court justices over their new congressional map, which both parties say will benefit Democrats. 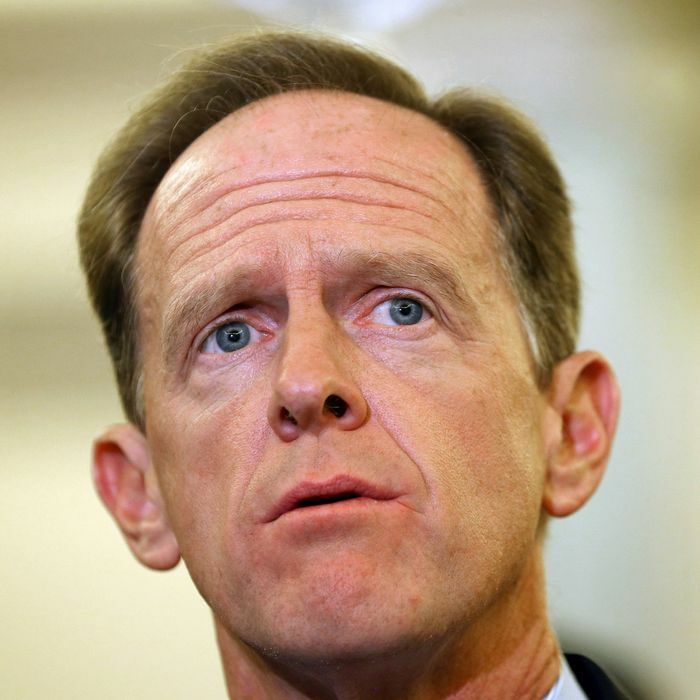 At a press conference, Toomey said it was “inevitable” that state lawmakers would consider impeachment over the redrawing of the state’s new congressional maps, which he called a “power grab” by state Democrats. Actually, to be more precise, Toomey called it a “blatant, unconstitutional, partisan power grab,” and while he didn’t say that it rose to the level of an impeachable offense, it sure sounds like it would were it true. At the very least, it’s time to figure out if Republicans have the power to reshape the Pennsylvania Supreme Court if they apply to the task the kind of unity they have exhibited in their impressively partisan gerrymandering efforts. The answer is probably yes. Under Pennsylvania’s constitution, elected officials can be impeached by a majority of the state House and a two-thirds supermajority of the state Senate. Thanks in so small part to the kind of gerrymandering that gave them 13 of 18 congressional seats with a bare majority of popular votes, the GOP has the necessary margins in both legislative chambers. The bigger question is what happens if the dog catches this particular bus and the five Democratic justices are removed from office. The governor, who happens to be a Democrat, fills vacancies in the state courts. But the governor’s nominees must be confirmed by a two-thirds vote in the state Senate. So Pennsylvania Republicans could be looking down the barrel of a stalemate or even a constitutional crisis that leaves the state’s highest court without a majority of its judges. Perhaps the impeachment talk is a negotiating ploy, or even an act of intimidation to encourage the five Supreme Court justices to think twice before applying the principles it used to redraw the congressional map to the legislative maps that have perpetuated GOP control. But Republicans really ought to think about how this will come across in the court of public opinion. Sure, their “base” voters are always open to efforts to curb the influence of “activist judges” (so long as the activism in question isn’t of the right-wing variety). But do they really want to go to the mats — and to the electorate —over the claim that they have some sort of divine right to representation in Washington or in Harrisburg that vastly exceeds their share of the statewide vote?